Occupational Science for Occupational Therapy articulates how occupational science research produces unique insights into occupation and increases the effectiveness of occupational therapy interventions. This text illustrates the four key types of knowledge now being researched in occupational science: descriptive, relational, predictive, and prescriptive. This text also offers a comprehensive review of occupational science’s history of emergence from the needs and interests of occupational therapy, conflicting origins and intents, and ongoing development as a discipline within academia. 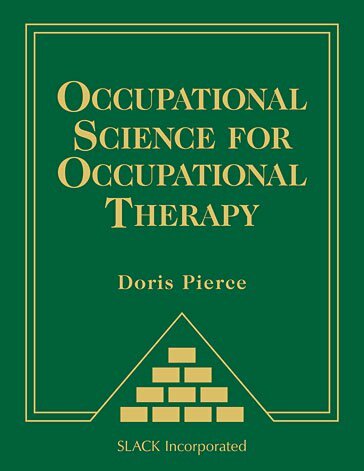 In Occupational Science for Occupational Therapy, Dr. Doris Pierce and an outstanding group of occupational scientists explain how their discoveries build the science and support practice. A rich variety of methods and perspectives mark the work of these career scientists as they respond to the knowledge base needs of occupational therapy. This fully evidence-based text also brings the research experience alive for occupational therapy students, describing the passions, challenges, and choices that are the reality of research as an occupation. All research chapters discuss how findings build both science and practice, including learning supports in which students can try out research activities, explore assessment, or develop interventions. Most importantly, Occupational Science for Occupational Therapy provides new and experienced practitioners a thorough exploration of the latest research in occupation-based practice. Occupational Science for Occupational Therapy synthesizes key works by occupational scientists, including a foreword by Dr. Elizabeth Yerxa, founder of the science. Occupational therapy and occupational science students, practitioners, and faculty will especially appreciate this book’s comprehensive coverage of work by current leaders of research on occupation-based practice. Section I Level 1 Research: How Does Occupational Science Provide Descriptive Knowledge to Strengthen Occupational Therapy? Section II Level 2 Research: How Does Occupational Science Provide Knowledge of Relations Between Occupation and Other Phenomena? Section III Level 3 Research: How Does Occupational Science Provide Predictive Knowledge to Support Occupational Therapy? Section IV Level 4 Research: How Does Occupational Science Enhance Occupational Therapy Through Research on Occupation in Practice? Doris Pierce, Ph.D., OTR/L, FAOTA is Eastern Kentucky University’s Endowed Chair in Occupational Therapy. She began her career with a BS in Occupational Therapy from Ohio State University, followed by an MA in Occupational Therapy and a PhD in Occupational Science from the University of Southern California. She has been a pediatric therapist for 30 years, trained at Ayres Clinic, and operated a private practice in the greater Los Angeles area for more than 10 years, serving infants and children in home, school, aquatic, and therapeutic riding settings. Dr. Pierce is a leading occupational scientist. Above all, she is centrally concerned with examining and strategically developing the theoretical potential of occupational science to support the knowledge base needs of occupational therapy. On a broad level, her work has explored research methods; international differences and similarities in the valued occupations of elder women; and key constructs of occupation such as co-occupation, occupation-based practice, and the relations between the productive, pleasurable, and restorative dimensions of occupation. Her initial occupational science research was responsive to her clinical interests in early childhood play, play objects in the natural settings of children, and mothering of children who are typically developing as well as developmentally challenged. Her current research focuses on the occupations of youth at risk and the development of occupational therapy transition services to secondary students with disabilities. She has directed several research and training projects in this area and is currently completing a mixed methods study for the Ohio Department of Education on the intervention processes and outcomes in occupational therapy transition services for secondary students with high-incidence disabilities. Dr. Pierce has worked steadily throughout her career to support the maturation of the discipline of occupational science. She chaired the charter group and served in a series of positions to build the first research society in occupational science and therapy, the Society for the Study of Occupation: USA. Dr. Pierce delivered the 10th Ruth Zemke Lecture in Occupational Science in 2011 as she was at work on Occupational Science for Occupational Therapy, as can be seen in the congruence of the perspectives presented in these two works. In 2000, Dr. Pierce accepted the Endowed Chair in Occupational Therapy at Eastern Kentucky University, a full-time research position created through a matching funds initiative of the Kentucky Legislature. Since then, she has dedicated her work to an occupational science and occupational therapy response to the needs of youth at risk. Dr. Pierce is proud of her cultural heritage, rooted in farming families of both eastern Kentucky and central Ohio. She also lives her passion for occupation as a dedicated wife, the proud mother of a daughter nearing completion of her occupational therapy degree, an amazed grandmother, an enthusiastic event planner, a heartfelt singer, and a writer reaching beyond her profession.